The new SP5014TRX couples the industry’s best hydraulic controlled self-propelled grinder with the versatility of a rubber track undercarriage. 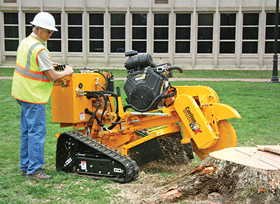 The SP5014TRX offers two engine options: 27 HP Kohler and 35 HP Vanguard. The SP5014TRX is also available with lever controls, wired remote control, or wireless remote control. 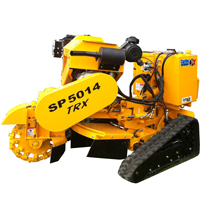 The SP5014TRX uses a rubber high track system that incorporates multiple idler rollers and spring tensioning to keep the track at optimal efficiency for running and tracking characteristics. This track system provides high floatation to minimize ground pressure and disturbance while providing a stable grinding platform and go anywhere traction. Feather Touch Hydraulic Controls make the SP5014TRX easy to operate and provide optimum user control. Proprietary Rubber Track Undercarriage – provides positive climbing power over the roughest terrain. Spring Tensioned Track – Keeps the tracks on the rollers and allows for easy adjustment. High Track Sprocket – Keeps the track drive sprocket out of debris. Keeps more drive teeth engaged than competitors. More Track Rollers than the competition – keeps the track in place across rough terrain.